On Saturday two off-duty firemen left a flyer on my front door offering their services in storm damage clean-up, so I gave them a call. They admitted that they didn't have a lot of experience in pruning trees, but were gracious enough to let me supervise. I do have a lot of tree pruning experience (which is why I am happy to pay someone else to do large jobs) and I'm sure I was extremely annoying, but they were kind enough not to let it show. Yesterday, my neighbor Randy came over from across the street and helped me cut up some of the waste into firewood, which he will use in his stove. What isn't used for firewood will go through my chipper later and become mulch for the vegetable garden. I think that on balance, the trees are better off for losing the limbs in the storm. They needed to be limbed up anyway, in order to open up the view to the house. These live oaks were also somewhat heavy in the leaf canopy, leaving them vulnerable to just the sort of ice build up that caused the problem. 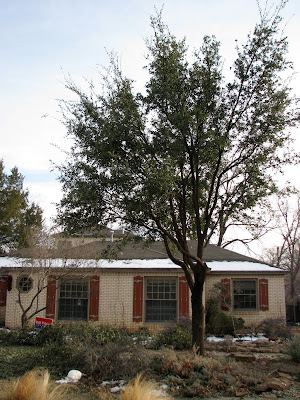 Live oaks are native to Texas, but they are not native to the Llano (few trees are), and since they keep their leaves in winter, they are not really built for heavy ice. Besides, I've always preferred the look of live oaks that are pruned to show the wonderful organic shapes of their branches. I wouldn't normally prune them back so hard all at once, but I think they'll recover just fine and start putting on new growth again come spring. You did a great pruning job on your trees. And hopefully your "crew" learned some valuable lessons about pruning that they can use on other folks' trees. Do your live oaks have prickly leaves like our coast live oaks? That's the only thing I don't like about them, I'm constantly pricking my fingers and it makes them hard to sweep up. They look good. It really opens up the area. What a dramatic difference a few days and a heavy pruning make, eh? The trees look great. Boy, do my live oaks need to be pruned, but they're just going to have to go one more year while other expenses take precedence. Wowee, did you get walloped by that storm. Your ice photos in the last post are beautiful, but ice is so nasty. You (and the guys) did a great job of fixing them up. In the long run I think the trees have come out ok - in much better shape now. Just as well that you supervised though - you could have ended up with two hacked up trees. I had to look up Llano, and now I know what a difficult environment you garden in. Here in SE Va. we are at the opposite end of the Live Oak belt and are in the only part of the state where they will grow. Wow! That was some ice storm. I think the whole 'lemonade' approach is a good one, I mean - you've got a jump on the spring pruning season (of course that is a season that I just made up, as a horrible neglectful pruner of things - but I thought it sounded good). I bet your anxious for warm weather to see how things grow. I'm Thomas from the new Dobbies.co.uk blog. We'd would like to know if you have any problems with being included? If you do, please let us know and we'll be happy to remove your site from the list. We'd also like to make you our 'Gardening Blog of the Week', so if there's any specific information you'd like us to include or if you'd prefer for us not to feature you, please do let us know. Thanks for your time. Drop us a line anytime. Dee--Hope you are thawing out up there. Glad that the branch that fell on the car didn't do a lot of damage! Michelle--yes indeed the leaves are prickly. It is usually too much of a problem, though, if I wear gloves when I'm cleaning them up. Pam--I've always liked a well-pruned live oak. The west one could still do with a little more shaping, but I think I'll hold off and let it recover from the shock this year. MMD--It was an impressive ice storm. There is tree damage all over town. Gail--The sound of chainsaws in the neighborhood has been steady since Saturday! EG--Ice storms are not uncommon here, but this one was more severe than most we've had. Les--I should have been more specific; we live on the Llano Estacado, up at the base of the Texas panhandle. It is windswept prairie, plain and simple. Cold, windy, and dry in winter, and hot, windy, and dry in summer. There is a town called Llano, in central Texas, in the heart of the hill country. The ecosystem is slightly different there, though conditions can be just as challenging. Pam--I think come spring things there will be some new growth on the trees and they'll look just fine. As it is, I've always liked the look of airy live oaks. They have beautiful branches. King Tom-- Wow. Your post popped up while I was writing my responses to the comments. I certainly do not mind, and in fact, I am quite honored. I'm headed over to the site right now to check it out. Oh your poor trees. But they do look good now. And so does your house too. I just had some folks out today doing some tree trimming but nothing like what you all just did! Well, you've taken this well--an it spurred on a whole series, huh? Last year I trimmed a river birch which I should not ahve bought--nursery left it far too dry = winter dead bits. I turned to Cass Turnbull who suggests everything you do, so I fell good about things--and hope to tackle my American Elm, though I'm scared to touch it for fear I might help it succum to DED.